A year and half ago, my husband and I took the plunge and purchased our first home. It was a tough process - especially considering the overpriced real estate market in and around Toronto and we were outbid (by a lot) many times before we found our little nest. When we finally found the one- we just knew. It had more than what we expected of our first home and it made it so clear that all of those offers we had previously lost out on, we lost because our perfect little place was waiting for us somewhere else. All that being said, there was (and is) still work to be done to bring the house up to our vision. 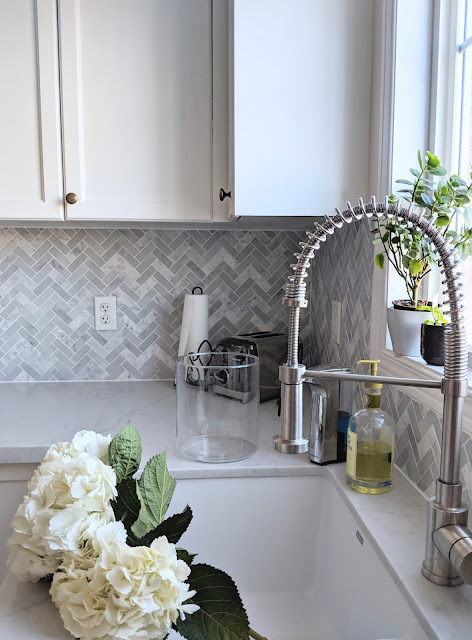 Obviously, I had my sights set on fixing up our kitchen first, but there were other more pressing situations around our home that needed attention right away. Anyone who has undergone a kitchen renovation knows that they cost a pretty penny and require a lot of moving parts to come together. 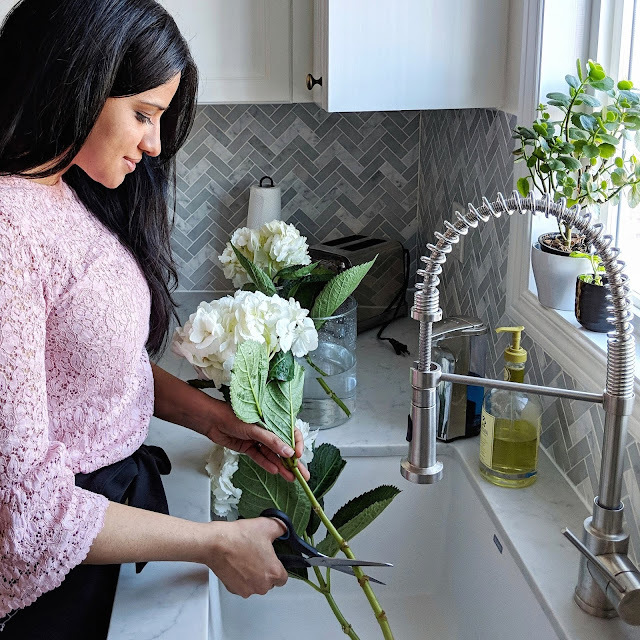 Today, I thought I'd share my tips on getting through a kitchen renovation - unscathed, smiling and while staying on your budget in case you're about to take a project on yourself. Inspiration is key when you're starting any home reno. I've been dreaming and drooling over kitchens since I was about ten years old (I'm the kid that watched HGTV religiously at ten years old). When it came time to tackling my own kitchen, I knew the exact look I was going for. Since my kitchen is also my studio for a lot of my video and photo projects, it had to be functional and photogenic too. I wanted a kitchen that was light, bright and airy and we definitely lucked out in the natural lighting department. If, you weren't a decor obsessed kid like I was and you don't know what you're looking for exactly, I'd suggest looking at magazines, Pinterest or Instagram to define your decor style. Once you have a few pictures you like, study them for themes or linking features. Is there a colour, finish, style or element you are drawn to? Slowly picking out design features that you are attracted to, will help you decide what your personal style is. My biggest tip is to make changes in stages. Yes, this means that your renovation project may take longer than you anticipated, but it also means your stress level will be more manageable and you can also be mindful of your budget. I cook a lot of homemade meals so my main goal was to never be out of a working kitchen for more than 24 hours. So far, we have managed to stick with that goal and we are about 80% finished with this project. Working in stages also allows for you to stop, step back and make sure everything has a cohesive look. When you are too close to a project for any period of time, it's easy to lose sight of the big picture. Step back and see if everything looks the way you imagined and make any changes or tweaks to your plan as needed. We decided to change what we absolutely could not live with first, as it would make the biggest impact in the space. We started with our cabinets and went from there, making the more noticeable changes first to extend our budget. Just because the previous owners had a certain setup, doesn't mean you need to follow suit. Try to think outside the box to maximize your space and impact. The previous owners of our home used the dining area as an extra living space with a couch and television. We knew that wouldn't work for us as we wanted to be able to host friends and family for dinner. We added a dining table that extends to allow for larger gatherings. We also felt there was some wasted space around our island and cabinetry. By giving ourselves some time, we were able to figure out some imaginative, affordable solutions to maximize our space, add some design elements and shop around for savings. My personal style is a blend of high and low price-point items which combine to create a beautiful finished look. Think about your dream items and where your dollars will make the most impact. I knew I wanted to upgrade our existing cabinetry, appliances, countertops and sink. I also wanted to add beautiful lighting. When we looked a little closer, we realized our existing cabinets were solid oak and in amazing condition. We decided to paint out our cabinets, which allowed us to save thousands of dollars on the project. We also DIY-ed our cabinet and shelving extension which gave us extra space without breaking the bank. This allowed us to really upgrade on dream elements like our incredible white with grey veins quartz countertop, marble backsplash and my favourite - our white SILGRANIT sink from BLANCO Canada. Silgranit is a natural granite composite material and comes in a variety of colours. Going with a white undermount sink, really elevated the look in our kitchen as it blends so perfectly with our counters. Once I heard that the sink was scratch, heat and stain resistant - I was sold. Plus- the sinks are made in Canada and Germany! I selected the PRECIS 1 3/4 - a sink with two basins - with one of them being 3/4 of the size. 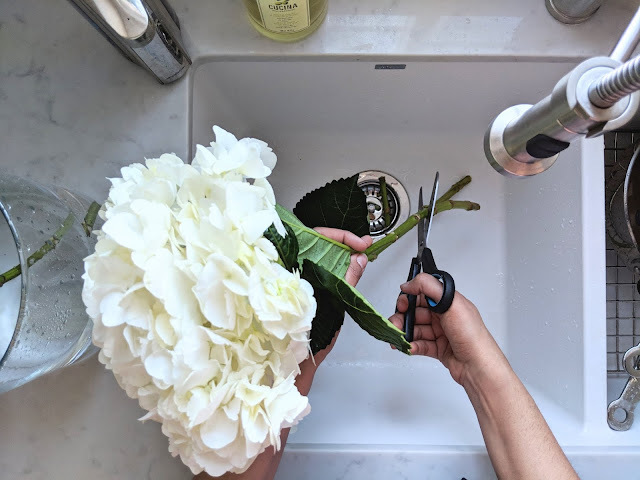 I wanted everything in the kitchen to have a purpose, whether it be aesthetic or functional, so I was excited to see that Blanco also has gorgeous faucets. I was looking for that professional chef style so I went with the DIVA Faucet in Stainless Steel. I also love that I could add accessories which help me to attain that sleek look I was going for, like the capflows which hide any little food bits trapped in the drain and the steel grid which allows me to dry dishes in the sink itself so I don't have to clutter my counters with a drying rack. There's nothing worse than seeing dirty dishes on the counter or piled in the sink when you're trying to relax. In our open concept home, it was important to select a sink that is deep enough to hide our dishes from sight until we are ready to wash them! By saving on certain elements of our kitchen design we could use more of our budget on luxury items that increase the value of our home and elevate the look of our living space. So I'd recommend you look for elements you can save on, so you can spend a little more where it counts! As with any renovation project, expect to hit some snags. For us - we approached many custom cabinet builders to take on our extension project. Contractors would commit and then cancel since it was such a small job. We decided to take it on ourselves and DIY it but coming up with a feasible and affordable solution took us a little longer than we expected. 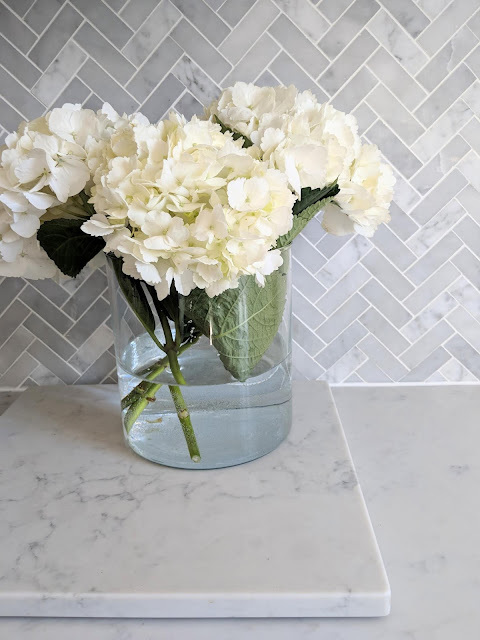 Also, when you're looking for a specific stone or tile, you can expect to have to wait for a special order or even make a cross border shopping trip happen. Make sure you allot extra time so that you can slow down and make the best decisions for your reno project. Allow the time to measure twice and cut once - you'll be glad you did. Hope these tips and tricks help you out when you take on your own home/kitchen reno project. Let me know if you have any tips you would add! I'm sure I'll need them when I tackle the bathrooms. A special thank you to BLANCO Canada for sponsoring this blog post. As always - all views and opinions are my own.